You probably have dozens of apps on your smartphone and if you haven't already it's probably time to organize these into folders because inevitably you're going to be adding to them. Here are the top ten apps I've picked up recently which have become indispensable for all kinds of reasons. Read on. 2. Sport.com All in Fitness. The best thing about this app to my mind is the huge base of exercises including videos for each one, plus workout plans. This app has been designed specifically for men and includes workouts for all levels, plus the facility to design your own workout. There's also a calorie counter. 3. Fitness for Women - Again from Sport.com Fitness for Women again has ready made workouts and an excellent base of exercises. Choose from ready made workouts, select from their base of exercises or create your own individual program. Oh and of course you can 'share' everything you've achieved. 4. Instant Heart Rate - if you like keeping track of your heart rate but don't want to invest in or wear a heart rate monitor then this could be excellent for you. From Azumio, you just download the app and place the tip of your finger over the camera lens to get your heart rate within just a few seconds. You can hook it up to Argus (above) as well. 5. Map my Run - With Map my Run you can map your route and track your activity, log your run and plan new ones. I personally think that the 'Create your Route' facility is one of the most interesting things here as who doesn't get bored with running the same route every day or so? 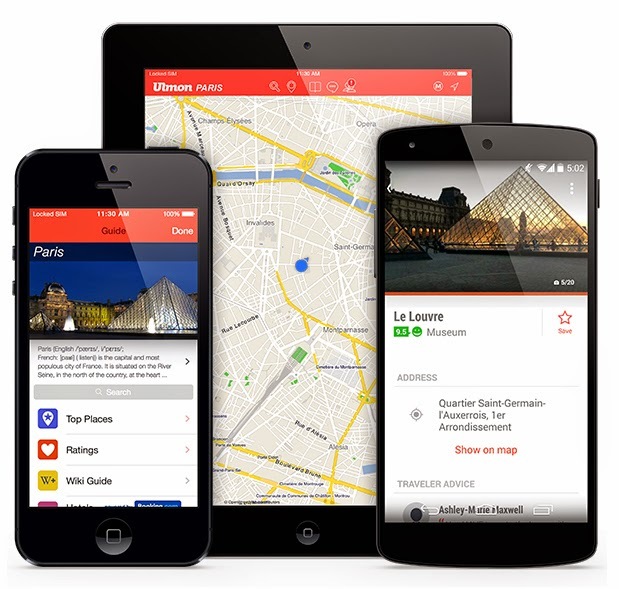 Route Genius will give you new ideas within your target distance. Available on both Apple and Android. Flight Aware. You're probably using some form of flight tracking app already, but this one is slightly different in that Flight Aware will show you not only how the flight you're tracking is doing, but historical data on average arrival times so you can see if your flight is 'likely' to arrive early or not. There's loads more here for flight enthusiasts so download this if you're a frequent traveller. Trip Advisor. Of course you've heard of Trip Advisor, but are you yet using this travel (and everything else) review app to find out where the best places are to stay or eat? Last week I found a restaurant for my son and his friend in Bergen, Norway, somewhere I hadn't a clue about, and it was excellent. Personally I wouldn't go anywhere without checking it out on Trip Advisor - the reviews may put you off but if they do it'll be for good reason. Travel Safe Pro. For the price of around 99p this simple but well thought app gives you access to emergency services wherever you are in the world. Thinking of dialling 999 in France? It won't do you any good there, but click into the Travel Safe app and using location technology it will give you your local emergency numbers for assistance for the police, medical emergency and fire. You can also record your own emergency contact details within the app. Communication is by text or phone. Both for Android and Apple. Uber. Uber hit the ground running in 2009 and this innovative taxi service is now available in 44 countries although not in every city. You can select which type of taxi service you want, including sharing, and via the Uber app you can see where your pick-up for each type of ride is and how long it may take to get to you. Set up your profile and payment details in advance you'll be picked up momentarily. Ulmon City Maps - Available for most countries, having downloaded the app you just click on the country name to get the list of cities there's a City Map for and then download it onto your smartphone, so you don't need the internet to access the information. This includes not just street maps (which you can search) but also metro/subway/tube maps, hotel guides, tourist attractions and much more. Of course there are thousands of apps out there for everything, these are some I have tested and used and found to be invaluable.